I surely believe in freedom of expression, but when it comes to Lawrence of Arabia, your individual opinion doesn’t matter. That might sound inherently wrong, but let me try to explain. This is a movie that is on IMDb’s Top 100 list of all-time greats. It was nominated for ten Academy Awards in 1963, winning for Best Picture, Best Director, Best Cinematography, Best Art Direction, Best Sound, Best Editing, and Best Music, the remaining nominations being Best Actor, Best Supporting Actor, and Best Screenplay. It’s a nearly four-hour-long epic shot on the grandest of scales, with armies of camels galloping toward crystal cities with Lawrence in the lead. Captured on camera. In the 60s. With no computers. Telling a true story with the whole world watching when movies were something completely different from what they are today. So, no, I can’t judge this film totally independent of its fame, and neither should you. Based on actual events, and following the brilliant military career of T.E. 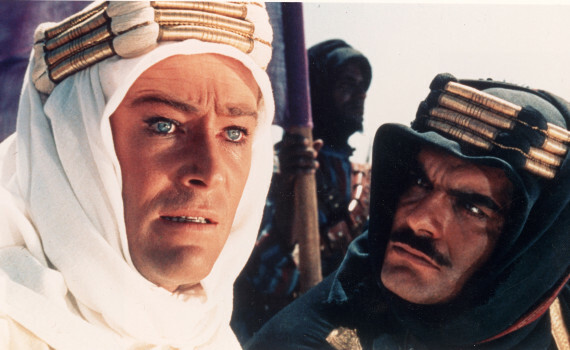 Lawrence, Lawrence of Arabia is a story like none other. We begin during WWI, at a time when British interests necessitate the removal of the Turkish Empire from the Arab world. Stationed in Cairo, England’s armies would like to drive Turkey east out of the Middle East, taking control of the canals there, and securing their foothold for the remainder of the war. But without the help of the native Bedouin peoples, there’s no hope. And so Lawrence is sent into the desert to meet with Prince Feisal, to discover what can be done. He soon realizes that the clans must be brought together to form one Arab Army, that peace must be forced in the region between feuding tribes, and that as a foreigner to this land he has no idea how this can be accomplished. But Lawrence is an extraordinary man, a leader by example, and a fearless warrior, able to win a following by daring what no man dares. It’s incredible to think about how war movies are made today, with thousands of tiny computer people marching across the land, duplicated to appear more than they are. In this film, what you see is what is. Camels & horses & guns & fortresses & men; these were staged, set into motion, and filmed, without any pretext and without complication. These are some of the grandest scenes you will ever see, an unfathomably large execution that I doubt today’s directors have the capacity to pull off. But it isn’t really the visuals that make the movie, though they are both impression & beautiful. It’s Lawrence himself, played by Peter O’Toole, a character that deepens with each scene, becomes darker with each death, and by the end can hardly be recognized as the jolly English soldier who set out for the desert so long ago. The film grows in scale with time, making each new chapter larger & more involved, forcing Lawrence to become something more than just a rallying cry, a governor of men and a chooser of fates. It’s an excellent character study set against a phenomenal backdrop, a film that takes effort to watch but rewards us in the end. Did I love it endlessly? No, and I actually like The Bridge on the River Kwai better, another Lean-directed, Guinness-starring film done five years earlier. But the claim to fame that Lawrence of Arabia stakes is unquestionable, as is its legacy, becoming something large than any one opinion.